Interview with one of the brightest stars in russian street workout community. She became famous shortly after here photo from the prom spreaded all over the internet. But fame didn't change her attitude towards street workout and trainings, so she is at the playgrounds everyday, mastering her craft. 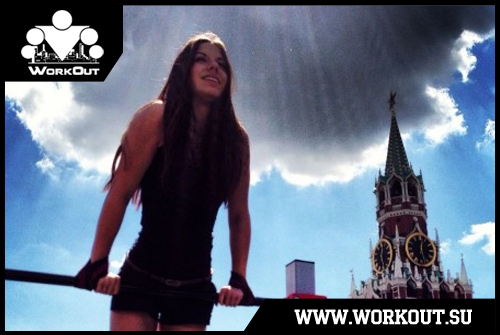 She also plays a big role in developing street workout culture among girls in Russia! Hi! For those who aren't aware tell me please about yourself: how did you decide to join workout? Hello! I started doing Street Workout in February 2012, so I only train for two years. It happened when I was finishing my school and I saw my friends making tricks on bars. I was surprised why girls don't train on bars too and I decided to try my skills because I was sure girls were strong enough to do it. Nowadays I help with organization of different workout events and travel around the globe with athletes. How did you feel when discovered your picture from school prom on fishki.net (popular russian entertainment site): a young girl in pretty dress on parallel bars? That picture could be seen all over russian internet. Did something change in your life? Did anyone recognize you when walking on the street? Well, it was just additional motivation to train a little bit harder and, of course, I was happy to know I inspire other people. I didn't get recognized on the streets, but my schoolmates and parents were very proud of me - and thats the most important thing! Now I'd like to make something really special so more people will know more about Street Workout! New competition season is beginning and female workout is getting more and more popular. I know you founded a team "WorkOut Grls 24". Would you tell us more about it? Yes, you're right. I always wanted more girls to visit our open sunday workout training sessions, and now, when girls in Moscow are showing a very good level, we founded a team. Every girl is special: each of them has got her own style, each one has got different interests but together we became a very friendly team. You already performed at two events together. What are your next steps? We would like to continue showing our skills, taking part in other events and progress further. We would also do our best to get more girls in Street Workout movement. Does your team plan to take part in any competitions and if yes what will it be: freestyle, base, gimbarr? Everyone knows that girls don't compete with boys, but Asya and Julia from our team are strong enough. So I suppose it's just a matter of time till they clash with the guys on a competition. 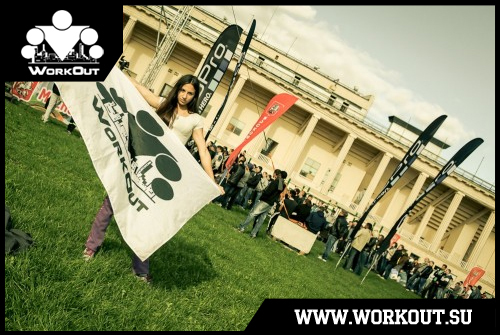 Do you have any plans on visiting other cities and countries to make Street Workout more popular among girls? Sure! This year our team is going to take part in Female World Championship in Amsterdam. I'm sure we could show a good example for other girls. We also do have pretty good chances on winning the whole thing! As I know you solely took part in many events in Russia and abroad. Which of them was the most memorable and why? Oh yes! There was a lot of events and competitions in the last year and I can talk for hours about every single one of them! Everytime I come somewhere I meet very friendly and nice people, who create really unique atmosphere for all the participants, no matter where they are from, or what their age or gender is. But the most memorable for me was my first trip abroad alone, without my family. Me and my friends from Ukraine decided to visit a workout event on Black Sea. I was the only one girl and the only one from Russia. My friends were happy to introduce me to the audience and asked me to make a little demonstration. I also got acquainted with ukrainian Street Workout founders there - Ivan Kozachok and Sergey Kudrya. Does workout help or disturb your personal life and relationships with guys? I guess a lot of girls don't start training because of two reasons: 1) I'm gonna look like a bodybuilder woman or 2) they're gonna take me for a tomboy. What is your opinion? Believe me, it only helps! Where else can you found a clever healthy and fit guys? Gaining weight like bodybuilders is impossible because we train only with our own body weight. And, of course, every time you attract more attention being the only one girl at the event! What Street Workout means personally for you? For me Street Workout became a lifestyle. It's everything for me: my friends, my job, my knowledge, my rest. Because of SW I got an opportuinity to meet different interesting people and got new friends in other cities and countries who would never let me down. And every event is like a blast of positive emotions! This is, truly, my life! Thanks for the interview! We wish you and your team Workout-girls 24 a big success! а чего на английском то?))) уже по-русски разучились?